URETEK ICR Rocky Mountian was contacted by Cereal Foods, Inc. concerning undermining and settlement issues of the sub grade soils of the railway track and load out canopy area of the Ogden, Utah plant. Settlement occurred due to a water main leak which had undermined sub grade soils around approximately 120 linear feet of railway track. The area of rail canopy is supported by five pillars. The middle of the five pillars showed the greatest amount of settlement of 1 to 6 inches while the other pillars in both directions had also experienced settlement, but to a lesser degree. 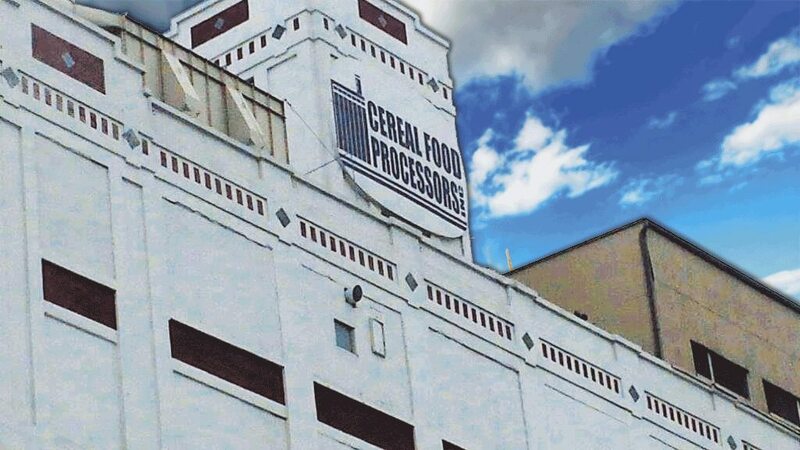 About Cereal Food Processors, Inc.
Cereal Food Processors, Inc., a privately held corporation, is America’s largest independent flour milling company and the fourth largest wheat miller in the United States. With 10 U.S. milling facilities, the company serves many and diverse segments of flour users. 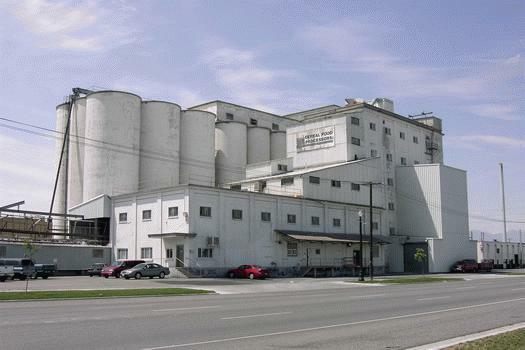 Cereal Food was founded in 1972 and has grown through acquisitions and expansions steadily over the years to a daily capacity of 101,760 cwts. of flour. The settlement at the Cereal Food Processor plant is in an area used to load rail cars with grain. It’s used on a daily basis with empty rail cars rolling into the canopy area, being loaded with grain, and then moving the heavy load to other parts of the plant for production. This being a vital part of the plant’s production sequence, taking the tracks out of service for an extended period of time would not only slow production, but affect the plant’s profit margin. Due to the non-invasive process and rapid curing time of URETEK structural polymers, the track was only out of service for a couple of hours. Soil test results revealed compromised soil in the settled areas at a depth of three to four feet below the surface grade. No settlement of the tracks themselves had occurred, however, tests performed beneath the tracks did reveal soft soils. As a preventative measure against future settlement in the track area, it was recommended to the owner to stabilize the soil beneath the rail ballast as well. Due to the non-invasive process and rapid curing time of URETEK structural polymers, the track was only out of service for a couple of hours. Initial soil tests were made in the areas of the canopy pillars and track sub grade. Results of the testing indicated very soft soil three to four feet down into the sub grade area. 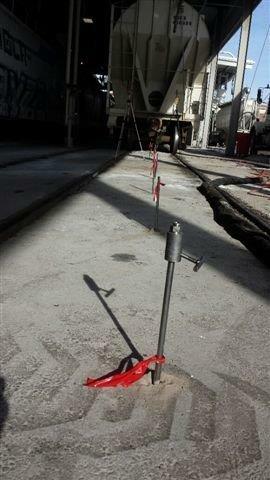 Penetrometer testing also revealed soft soil beneath the track area as well. URETEK Deep Injection® Process was used to stabilize the affected areas. 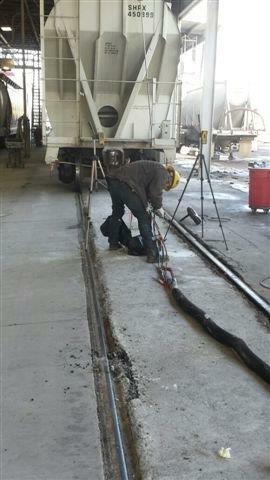 Repair work began at the center of the east track. 5/8” holes were drilled and probes placed into the sub grade soils. structural polymer was injected through the probes into the soil on five feet center and four feet below the top of the concrete/asphalt overlay. The purpose of the injections between the tracks was to fill any voids, stabilizing the weak soil, and interlocking the sub grade with the ballast, preventing future settlement. Once the track area was completed, injections were then made beneath the spread footer of each of the five pillars to stabilize soil and prevent settlement. The two pillars with the most severe settlement were addressed first. Injections were made at depths of one, three, and five feet below the bottom of each spread footer. For the remaining three pillars, injection was made at one and three feet below the bottom of each spread footer. Close monitoring of surface movement at the surface was made during injection, and movement was detected from all injections. URETEK ICR Rocky Mountain successfully stabilized 120 linear feet of track area sub grade soils URETEK ICR Rocky Mountain successfully stabilized the five supporting canopy pillars in the rail car load out area URETEK ICR Rocky Mountain successfully stabilized 120 linear feet of weak soil beneath the rail track area. Repairs were completed in one day. Track was useable immediately following injection of subgrade soils. Conservatively reduced repair costs by 50% (versus reconstruction). Repairs permanently stabilized the source of the settlement – weak soils, mitigating future settlement and damage to canopy as well as rail track line through area.